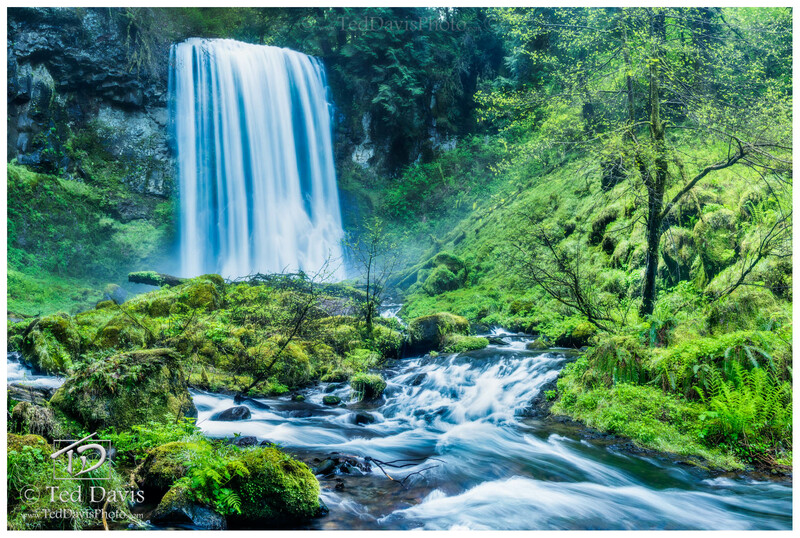 The Columbia River Gorge is home to hundreds of waterfalls. Some are massive falls with easy trails and other are smaller cascading falls lost amongst the canyons with no known names. In the depths of the Gorge, without any trail markers and only vague directions to go by, I was on a lost waterfall hunt during spring runoff! After hours spent scrambling over moss covered rocks through small chasms during a rainstorm, I slid down a massive ridge crash landing in a rocky stream bed. As I began hiking upstream towards the source of a far off roar, I abandoned every preconception of knowing where I was. It wasnâ€™t long though before I was standing beneath a towering waterfall lost in time. Alone in a rocky chasm as the rain intensified, I was overwhelmed at the intense power and beauty of Mother Nature. Letting free a primal howl I couldnâ€™t contain, I had found my veiled waterfall. Photo © copyright by Ted Davis.